There is something very appealing about Black Wensleydales. Their long curling forelocks and clean black faces give them a Rastafarian look which always attracts much attention. There are records of a totally black flock being kept in the early twentieth Century to decorate the front field of the owners country estate! Traditionally though, Black Wensleydales were considered unacceptable by farmers, as a black fleece was of little value. Recently, with the increase in demand for natually coloured wools, their black fleece is listed in the wool board schedule as one of the highest priced. There is a great variation in the fleece, not only in the colour, but also in type. Some have a very tight crimp and others very open with a big loose curl and softer handle - the latter being more of a spinning fleece. 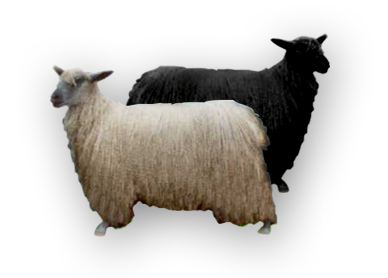 The staple of a black yearling fleece is often not quite as long as that of a white. Black fleece, especially with a long staple and good crimp, is very popular with felters. Black lambs can be thrown occasionally by white parents. This is because the black gene is recessive. Very simply, the sheep carry two colour genes. So the progeny of two WB sheep could be WW, WB, BW, or BB - theoretically a 25% chance of throwing a black lamb. Of course two white coloured sheep will be much less likely to throw a black lamb, since they could be WW sheep. What we do know is that with any pair throwing a black lamb both must be carrying a black gene. The Wensleydale Association runs two registers, one for white sheep and another for black. The "black" register contains sheep of all colours other than white namely, light silver, shades of grey and black- and also white sheep which have thrown a black lamb, showing that they carry a black gene. The advantage of this system is twofold - the society are acknowledging the demand for, and promoting, the coloured Wensleydale, and secondly, any purchaser of a white ram can be more or less guaranteed that it will throw only white lambs. Some lambs born very black turn grey after their first clip. Our original ram, Scotson Moor stayed very black and his line tended to keep their colour. Initially, before the society split the flocks, we were fortunate to get several black lambs from the white flock which gave us a broader base from which to breed. Now our black flock is completely separate from the whites. Recently black breeders have become concerned that this segregation from the much larger white flock is having a limiting effect on the number of lines in the black flock as a whole.